We are in our series on the Book of Jonah, called, “RUNNING FROM GOD” and this morning we are in our fifth message titled “THE POWER YOU’VE BEEN LOOKING FOR.” We are talking about the Resurrection Power. The power that brought Jonah out of the great fish after being inside for three days and three nights. It is the same power that brought Jesus out of the grave after being dead for three days. It is the same power that brings a dead sinner to everlasting life. It is also the same power that gives us victory over sin and effectiveness in service. This power is not optional. It is essential. Jonah 2:10 – 3:3 10 So the LORD spoke to the fish, and it vomited Jonah onto dry land. 1 Now the word of the LORD came to Jonah the second time, saying, 2 “Arise, go to Nineveh, that great city, and preach to it the message that I tell you.” 3 So Jonah arose and went to Nineveh, according to the word of the LORD. Overall Background: Listen to verse 10 once again – “So the LORD spoke to the fish, and it vomited Jonah onto dry land.” I want us to think about that for a moment. I’ve spoken to our dog and she does what I tell her to do (most of the time). I’ve spoken to our cat and he never does what I tell him to do. I’ve seen animals like horses, elephants, tigers, and even dolphins respond to their trainers. But how do you get a great fish (probably a whale) to respond to you? We’re not talking about just any trick from Sea World like jumping through hoops or tossing a ball in the air. We’re talking about spitting up a human being that has been in its stomach for three days and nights, for all practical purposes is dead. By the way, it’s not just spitting him up because the fish could have done that in the middle of the sea. But spitting him up on dry land! What kind of power is this? This is God’s Resurrection Power. It is God’s power to bring life where there is death. Human beings may try recreating this power but all they can come up with is Frankenstein.Jonah was brought to life from his death like existence by God’s Resurrection Power. He wasn’t the only one. Seven hundred years later, Jesus compared Himself to Jonah in Luke 11:30– “For as Jonah became a sign to the Ninevites, so also the Son of Man will be to this generation.” Unlike Jonah, Jesus was literally dead in the tomb for three days. Now listen carefully – This power was not limited to just Jonah and Jesus. It is the same power that brings a sinner dead in trespasses and sins and makes them alive together with Christ (Ephesians 2:5). If you are lost this morning, I can’t make you alive. I can only point you to the one who can make you alive. Only God’s resurrection power can make you alive. Lost or saved, you need resurrection power in your lives. Let’s see how this power works first in the lost and then in the saved. I. RESURRECTION POWER FOR THE LOST. Let me make a rather obvious statement. To be resurrected, you have to die first. Background: That phrase “3 days and 3 nights” is a popular Near Eastern motif. It was often used to portray the time taken to go from the land of the living to Sheol or back. Many times in the Old Testament we find that phrase. Abraham’s journey to Mount Moriah to sacrifice Isaac took three days. The Israelites wandered in the desert for three days before God provided water for them. Hosea says in chapter 6,1 Come, and let us return to the LORD; For He has torn, but He will heal us; He has stricken, but He will bind us up. 2 After two days He will revive us; On the third day He will raise us up, That we may live in His sight. So 3 days and 3 nights was a picture of death. This does not mean that Jonah died inside the fish but he was in a death like state. He was powerless. Unless an external source of greater power than the fish were to step in, he is as good as gone. Those who are lost – Eph. 2:1 “And you He made alive, who were dead in trespasses and sins.” Every person comes in this world alive and dead – alive physically but dead spiritually. You are born inside the belly of the great fish – dead in trespasses and sins. No matter how much you try, you cannot get out. Some people trust in their good works to get out. They try helping the poor. They try to be neighborly (visit the sick and help the elderly). They try to be good parents. They try to be good citizens. Some people even try to help in church. Nothing helps. Listen to Ephesians 2:8-9 8 For by grace you have been saved through faith, and that not of yourselves; it is the gift of God, 9 not of works, lest anyone should boast. You have to acknowledge that you are dead. All the good you are doing is wonderful but you have to trust in the cross of Jesus for God to bring you out of the great fish of sin and death. Application: Have you come to a place where you have acknowledged that you are dead in trespasses and sins? Have you looked up and said “God unless you save me, I will die in my sins?” Have you prayed to receive the sacrifice of Jesus on the cross for you? II. RESURRECTION POWER FOR THE SAVED. Those who are saved – It’s wonderful that God delivered you out of the fish of sin and death. But there is another fish. This is the fish of self-effort – in dealing with personal sins and serving the Lord. Before you can have victory over sin and power for service, you also have to acknowledge your utter helplessness without the power of God. We think that once we get saved, we need to get busy living for God and serving Him. If you do these in your own power, you will have nothing but defeat. 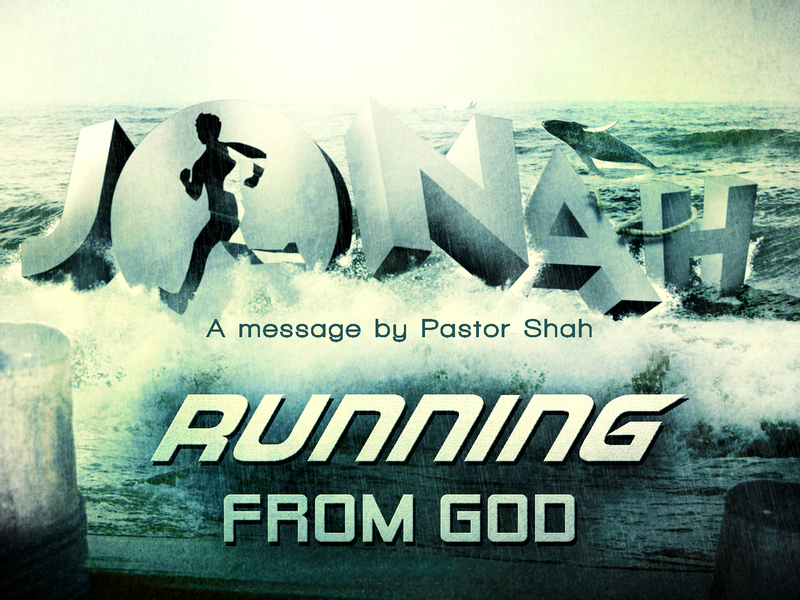 Let’s look at Jonah’s story once again – Jonah ran from God. Did that surprise God? God knew that Jonah would disobey Him. God knew that Jonah would get into that ship to Tarshish. He was not caught off guard. As David said inPsalms 139, 1 O LORD…2 You know my sitting down and my rising up; You understand my thought afar off. 3 You comprehend my path and my lying down…16 Your eyes saw my substance, being yet unformed. And in Your book they all were written, The days fashioned for me, When as yet there were none of them.” If God wanted to stop Jonah from running, He could have stopped him before he even got out of bed. If God wanted Jonah in Nineveh, He could have prepared a great bird to airlift Jonah and drop him at the gates of Nineveh. So why did God let Jonah run? God knew that Jonah was not ready to go to Nineveh. Don’t misunderstand me – disobedience was wrong and costly. But God knew that Jonah had no power against Nineveh. Nineveh was a wicked city, a sinful city, and a corrupt city. In his own strength and power he couldn’t do anything. God knew that before Jonah could go to Nineveh and preach, he had to die to self and be filled with God’s resurrection power. Application: Many Christians are living in defeat and many Christians are living without fruits because they are trusting in the power of the flesh. They are trying to live for God and serve God in their own strength and power and they keep falling on their face.They may be sincere. They may be passionate. They may even claim, “It’s not me. It’s God.” But they are still working in the energy of the flesh. This kind of power does not come by singing louder, preaching harder, or praying longer. All that is good. But, God’s resurrection power only activates by drawing closer to the place of death. You have to come to place of helplessness and acknowledge – “God, I can’t but You can.” This has always been God’s way. Jesus said in John 12:24 “Most assuredly, I say to you, unless a grain of wheat falls into the ground and dies, it remains alone; but if it dies, it produces much grain.” Although Jesus was talking about His crucifixion and burial, He was also laying out the principle of the Christian life. Jonah had to come to the end of himself before he could go to Nineveh. God was going to use Jonah’s disobedience to bring him to a place of death. Isn’t that what God does in our lives as well? Even when we sin, He turns our disobedience, weaknesses, failures, and mistakes to work together for our good. For e.g. Have you ever heard someone say – “Even if I were to go back, I won’t change anything.” Did we say that at the time? Of course not! Why do we say that now? Because God turned even our mistakes, failures, and sin into something positive in our lives. What is this positive? It is to bring us to a place of utter helplessness and weakness – a place of death – where we turn from relying on ourselves to relying upon God. Application: Is God leading you through the valley of the shadow of death? Are you inside the belly of the fish? Has it been one day, two days, or three days? Don’t give up. Hang in there. He will not leave you there. He is bringing you to the end of yourself so He can give you His victory over sin and His power for service. How did it go for Jonah? Jonah 2:10 So the LORD spoke to the fish, and it vomited Jonah onto dry land. What happened next? Did Jonah continue his trip to Tarshish or return back to his home? Neither. Listen again to Jonah 3:1-3 1 Now the word of the LORD came to Jonah the second time, Aren’t you glad we serve a God of second chances? I’m jumping ahead but Nineveh was a city where people, and even animals, in God’s words, could not tell the difference between right and left. Jonah went to this city, full of the resurrection power, and preached a simple message – “Turn or Burn” and the entire city repented. Wow! What was the secret? It was the Resurrection Power operating in Jonah’s life. Before, he was just a prophet of God. Now, he was full of the power of God. Are you living in God’s Resurrection Power? Are you saved? Thanks so much for stopping by! God bless you!